Back when I graduated from university Andrew and I rented a car and drove between Paris and Strasbourg, winding through the Champagne region, camping, and sneaking out of campsites before we had to pay the next morning. 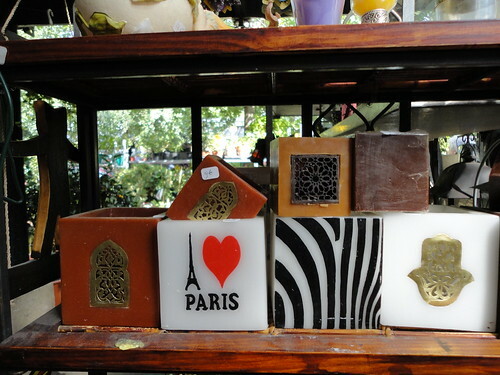 I went to Paris again in 2005, this time with Lesley. She was going to grad school in Victoria, I wanted to hang out with her, but tickets to BC from Toronto were exorbitant. A ticket to Paris, on the other hand, was surprisingly much cheaper, and because we could stay at my cousin Panayiotis’s apartment, the trip was actually economical. 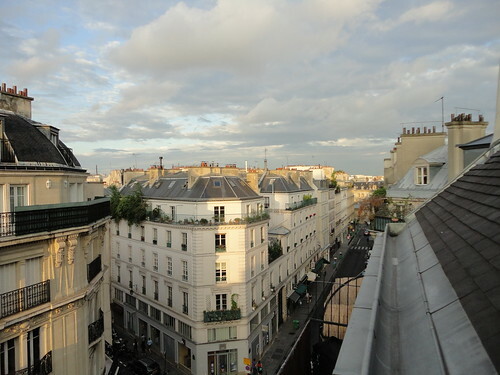 Both trips were wonderful, but it’s funny: I’ve been in France for the past two and a half weeks, and it was like the Universe was all, “You think you had good times in the past? I bet I can do even better than that.” Um, sure? Merci beaucoup, Universe. 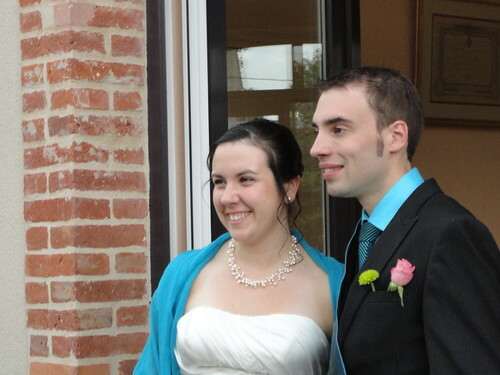 The motivation for the trip was the wedding of Lisa and Alain. They live in Montreal, but Alain is from Breuil, a village in Champagne, which is where they decided to host their nuptials. A bunch of us arrived a few days earlier to enjoy the countryside and drink champagne. I left Montreal at the beginning of May, and was ecstatic about the idea of catching up with best friends in such an idyllic setting. 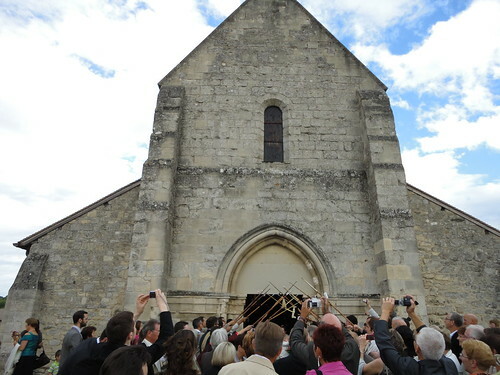 The wedding itself was beautiful, and the ceremony was in an old stone church in Breuil where we sang (or at least, attempted to sing) French church hymns. 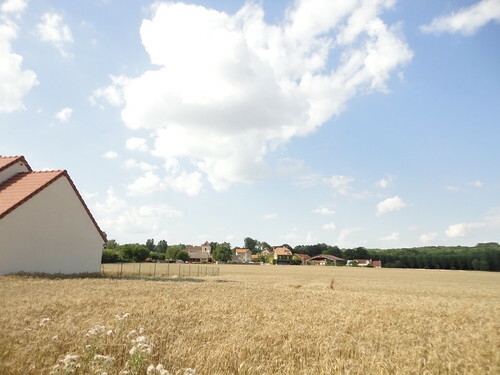 The reception was in another nearby village, Fismes, where the meal lasted until midnight, the champagne flowed freely, and the dance floor was busy. It was a perfect celebration. This photo speaks for itself. 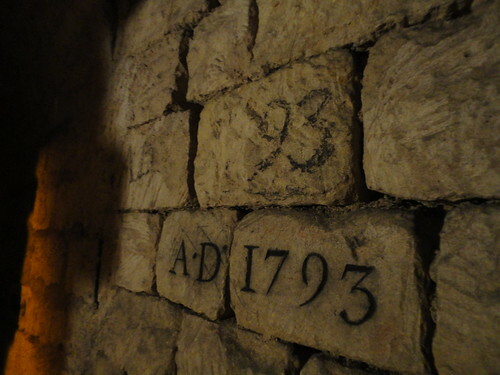 After 2 hours of exploring tunnels, we were hungry and went off in search of a bistro. I had an entrecote, Andrew had steak tartare. There was wine. We went home and napped, and then set off again, first making a stop at the bookstore at the Centre Pompidou. We eventually ended up at La Grande Epicerie in the Bon Marche department store. My version of heaven would include a Grande Epicerie, which is stocked with every French food you were ever curious about. There is one counter specifically for foie gras, with prices over 100 euro per kilo. You can get bottles of Angelina hot chocolate, slices of Pain Poilane or jars of Christine Ferber jam (a steal at 6.75 euro a jar compared to what I saw at other stores!). We bought supplies for a picnic and then headed off to the Champs de Mars where we were meeting Panayiotis and Marieme. 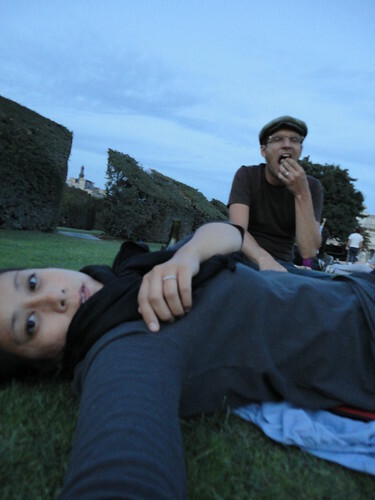 The clouds were ominous, but we stubbornly set up shop beneath a tree anyway and spread out our food. When it started to rain, we took out the umbrellas and ate underneath those. 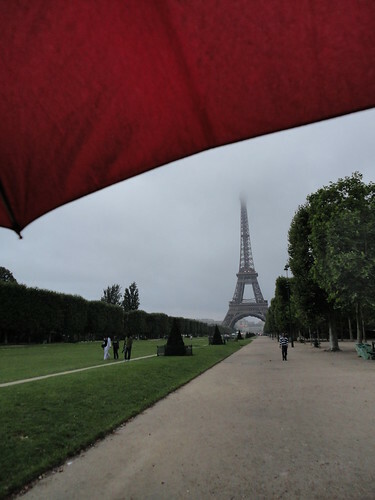 The Eiffel Tower was beautiful, all swathed in fog, and the fields were mostly empty, and we were proud of ourselves, the most prepared picnickers in all of Paris on the evening of Saturday August 7, 2010. 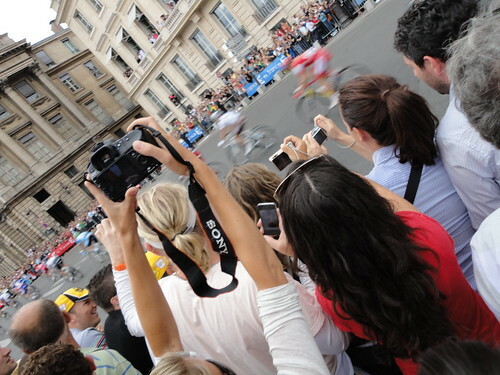 We were also lucky to be in Paris when the Tour de France ended, and after eating lunch here (Which Les wrote about), we sped over to Place de la Concorde to watch the cyclists do their final stage in Paris. Andrew is a Tour de France fan, so I’ve learned terms like “peleton” and “maillot jaune” and it was exciting to be part of the massive crowd cheering on the cyclists. You don’t get a sense of how fast they’re biking until they pass by in an overwhelming blur, and when you’re standing so close to it, it’s engulfing, like a quickly rising cloud of dust. Other happy coincidences: The day before I left, I found out via Twitter that one of my favourite food writers, David Lebovitz, was doing a signing in Paris. I was able to swing by and buy a copy of his book, The Sweet Life in Paris. The Clair de Lune film festival began and we spent one evening watching A Bout de Souffle outdoors in the Jardins des Champs Elysees. We sat near the front, Jean Seberg larger than life in scratchy black and white film, everyone around us huddled in scarves and drinking wine they’d brought themselves. We’re now back in Athens where I hope I will shed the extra pounds I’ve gained from eating cheese every single day simply by sweating. I would also like to rest my feet a little, and do a million loads of laundry. Everyone in the city is on vacation until August 23rd according to the little signs I see taped hastily to store windows, but now it’s my turn to be productive again. A bientot.